Amazon has given me a precious gift: infinite new ways to troll my family and house guests with Alexa. On Thursday, the company released a set of DIY apps for the voice-assistant that anyone can make. They let you create helpful and entertaining voice commands and replies customized for your family. 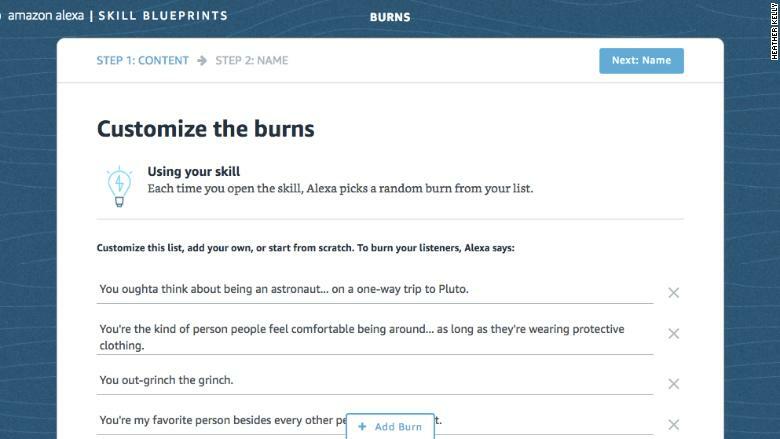 Called Alexa Blueprints, the templates are a dead-simple way to make Alexa do your bidding. I've spent the past day making and testing my own Alexa apps. You can create custom question and answers ("Q: Alexa, who should cook dinner tonight?" A: "Not you my queen, go rest and watch Netflix.") load it with dirty jokes, or write interactive stories. There's fun games for couples or kids, and trivia about a bride-to-be to play at the worst bachelorette party ever. If you need a self-esteem boost, type in your own compliments and Alexa will recite them on request. Its default compliments are nice enough, but some sound like bad pick-up lines ("Is that your picture next to charming in the dictionary?"). For the most part, you're just deciding what words Alexa will say out loud in that signature Alexa voice. At them moment, there's no way to link the actions to other outside apps or information, like songs or a smart light. The story templates are the most enjoyable. 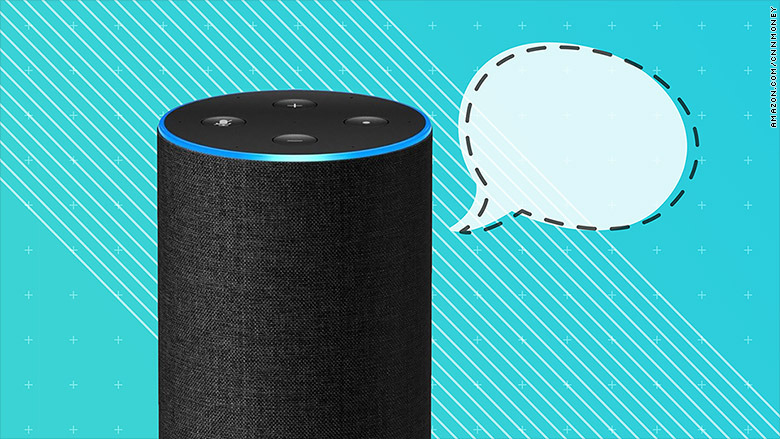 Write any yarn you want, and include fun noises, exclamations from Alexa ("Cheerio!" "Yuck! "), and words chosen by the listener before the story starts. Naturally, I created a Mad Lib about an escaped zoo animal who needs help finding her lost valuables, but is thwarted by George Clooney. The more practical Blueprints are clever, but I don't see them being more useful than a sheet of paper. If someone is watching your child/dog/house, they can ask Alexa for information like an emergency contact, allergies, and daily schedules. You can add your own questions like "How do I scratch Fido's belly?" and answers such as "Gently, with your left hand in counter-clockwise circles." Having control over everything Alexa says is especially helpful when it comes to dealing with people who think it is a real person. Like children. Kids will sometimes respond to the authority of a third-party more readily than they would their own parents. You can have Alexa tell them to do chores, stop fighting, or go to bed. Child-rearing experts I spoke to recently warned against outsourcing your authority to a voice assistant, but once or twice probably won't ruin them. I set up a Blueprint question to instruct one child to apologize to the other. It worked once, but I expect they'll catch on eventually. While fun, the new tools still have the usual Alexa frustrations. For example, it repeatedly misheard the name "Seth" as "South," ruining a perfectly mediocre joke about my colleague, Seth Fiegerman. To try your own apps, go to blueprints.amazon.com and pick a template. Most are pre-filled with suggested text. You can alter it or replace it entirely. For example, open the Burns template to see a list of insults like "You are a pizza burn on the roof of the world's mouth." Select the text and replace with better insults, customized to your housemate's deepest insecurities. Once you're happy with the Blueprint, name it and save it. It will take a couple minutes to upload. Then you say "Alexa, open [name of app]" or "Alexa, [your custom question]" to get started. They will only be accessible from your own Alexa-enabled device, so any personal information you include is for your ears only.